The paintings of Sydney Laurence depict an Alaska where nature is big, and people are small. A man carries a bundle of sticks to a fire built on the bank of a river, to a speck of yellow that barely stands out against a darkening streak of sky. A lone log cabin is seen from a distance that reveals the depth of its solitude; it is surrounded by several Sitka spruce fading into a forest, one that deepens into mountains so vast they range out of view. Finally, and most frequently, Mount McKinley rises from a swirling mist tinged with purple and blue, looming above the landscape, indifferent to the world below. Woodward notes that Laurence, who came here at the turn of the last century and became, by the 1920s, a well-known artist in Anchorage and throughout the region, was the first professionally trained painter to make Alaska his longtime home. 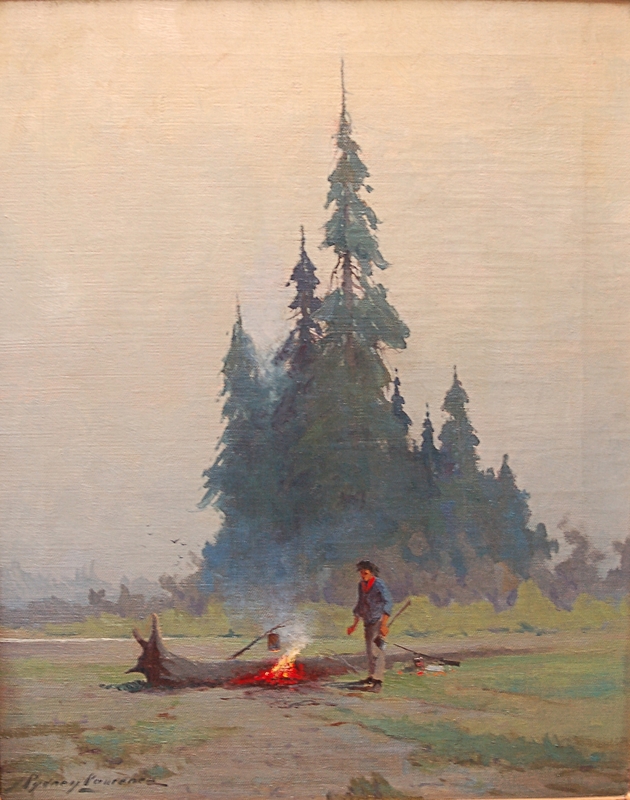 Although his work is relatively unknown outside of the Pacific Northwest, the scenes Laurence created can be hard to miss in Alaska; his paintings, and reproductions of those works can be found in museums, in the lobbies of banks and hospitals, and in galleries, gift shops and drugstores throughout the region. Addison Field, Curator of Collections and Exhibits at the city museum, agrees that Laurence’s influence has extended far beyond the realm of art, shaping our perceptions of the Alaska landscape. “His views documented our history; they became Alaska to us,” Field said. Woodward believes that certain themes found in Laurence’s work might be worth a second look. Laurence’s model is a stalwart standby for many regional artists, who emulate his romantic images of Alaska as an untamed frontier. Christine Crooks, a member of the local artists’ group Plein Rein Painters, acknowledged Laurence’s lingering sway over how Alaska is portrayed, and his “in-depth impact” on our perceptions of Alaska. Think hard-driving rhythms, fast-paced improvisations, and high-pitched vocals that wind up and down the melody like an inquisitive strand of kudzu. Photo courtesy of the Great Alaska Bluegrass Band, The Great Alaska Bluegrass Band, with Brooke Munro, left, Scott Burton, Andrew Heist and Jeremy “Junior” Kane, celebrated the release of their new album, Semi-Bluegrass, at The Alaskan Bar in Juneau. 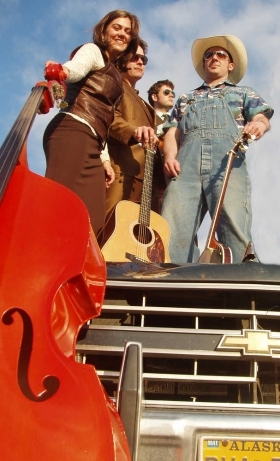 There is something brave about bluegrass, about the honesty of a group of musicians who stand up on a stage, before a crowd, with nothing but their instruments and a story to tell. And when it’s done right, a good bluegrass tune will make your pulse quicken and your blood rise up; it’ll be like a ride down a wild, rushing, twisting river. What makes bluegrass different from, say, a standard country song? And traditional bluegrass, the way it was played back when it began, is what TGABB wants to epitomize, says Kane. Photo by Bobby Miller Performance artist Penny Arcade will be presenting her one-woman show, “The Girl Who Knew too Much,” at the Perseverance Theatre Friday evening and at The Rendezvous Saturday. A few weeks ago, Perseverance Theatre’s Artistic Director Art Rotch found out that playwright and performance artist Penny Arcade was coming to Alaska for a visit. Rotch isn’t alone in praising Arcade; when recounting his 10 most influential art experiences to Rolling Stone magazine, singer Jeff Buckley included Penny Arcade in the list. And yet, chances are you’ve never heard of her. When Ishmael Hope’s grandfather died, his family and friends gathered to pay tribute. As they stood to share their stories, they spoke in a language that had, for thousands of years, served Alaska’s Native people: They spoke in Tlingit. “My dad said, ‘Man, when an Elder gets up, and speaks from the heart, that is like soul food,’” said Hope. When his own father, Andy Hope III, passed away in 2008, Ishmael Hope decided it was time to study Tlingit himself. According to Sealaska Heritage Institute figures from 2007, Tlingit is spoken fluently in America by only 200 to 400 people, and is considered by many to be an endangered language. For Hope, learning to speak it is a way to respect those who came before him. Hope’s previous plays include “Raven Odyssey,” “Cedar House” and “Gunakadeit,” which was performed at the Smithsonian’s National Museum for the American Indian in Washington, D.C.
His newest work, “The Reincarnation of Stories,” opens tonight, and features four actors — Frank Katasse, Edward Littlefield, Erin Tripp and Hope himself — who will perform the story of Naatsilanei, the birth of the killer whale. They tell the tale in Tlingit, as it was once told by traditional Tlingit artist Willie Marks. While everyone in the cast was raised speaking English, they have also each studied Tlingit. Alaska attracts adventurers, people who come for the tall mountains and the deep rivers, who envision themselves discovering something new even as they lose themselves in an ancient wilderness. Among these dreamers from down south are the artists who want to capture the less tangible aspects of the quest: An image, a rhythm, a phrase, that will evoke what it means to be here. But for writers, describing a place so larger-than-the-usual-life can be hard to do; too often, the words and phrases used to convey Alaska’s vastness can dwindle into small stereotypes. “I grew up in inner-city Portland,” said local poet Emily Wall. “It’s almost easier to write about nature in tiny restricted places. Here, oh my God, where do you start? It’s so large! Wall, an assistant professor of creative writing at the University of Alaska Southeast, will be reading her poems at next week’s Wildlife Wednesday, a lecture series sponsored by the Alaska Wildlife Alliance, a nonprofit organization committed to the conservation, protection and promotion of our state’s wildlife. Her presentation is titled “Writing Eden: Looking for Home in the Natural World.” Wall will be reading poems from her previously published book, “Freshly Rooted,” as well as works from a new collection. Many of the poems in “Freshly Rooted” explore Wall’s experience both as a new wife and a new Alaskan, and were written after she and her husband decided, almost on a lark, to come to Juneau. They moved here five days after they got married; they planned to stay for a year or so. But then they fell in love with the place, said Wall, and ended up settling in. Wall believes many of us are searching for the archetype of Eden, for an unspoiled frontier. Wall’s poems, which often focus on our place in the natural world, recast our perceptions of daily life in Juneau by enticing us with a new take on what many of us see every day. Tina Brown, president of the Alaska Wildlife Alliance and coordinator of Wildlife Wednesdays, said she is looking forward to Wall’s reading. Like Wall, Brown was initially drawn to Juneau because of the town’s proximity to the Alaska wilderness. 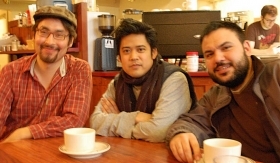 Brown believes the character of Juneau’s people enhances its appeal. 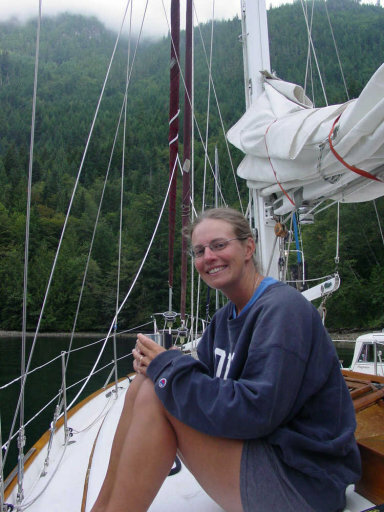 As liveaboards, Wall and her husband would cruise for 2,000 miles up and down the coast, using a dock in Vancouver as their home base. The experience taught her that nature’s untamed wildness, its fierce lack of predictability, can actually foster community; sometimes the farther into the wilderness we venture, the more we need other people to help us survive it. The need to help, and the desire for support, creates an intimacy that isn’t so common in the Lower 48, says Wall.